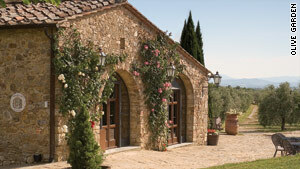 Riserva di Fizzano is a cooking school part of the year and a bed and breakfast the rest of the time. (CNN) -- A ubiquitous Olive Garden TV commercial shows a picturesque cooking school in Italy as a voice croons words like "artisanal" and "fonduta" and smiling chefs in starched whites coats taste tomato sauce straight from a simmering pot and kiss their fingertips with glee. TV-watching skeptics turned to social networking sites like Twitter and Facebook to question the popular Italian chain's claim of "culinary inspiration" from Tuscany. Is this Culinary Institute of Tuscany, a bona fide bastion of learning? Or is it just an advertising fib? Yes, Virginia, there is an Olive Garden Culinary Institute of Tuscany -- though the ownership is somewhat shared. The Institute opens its doors to approximately 100 of the best-performing chefs and managers of U.S. Olive Garden Restaurants each winter for 11 weeks. It began these authentic Italian cooking lessons in 1999. "During the rest of the year, the property, named Riserva di Fizzano, is a bed and breakfast, complete with the Rocca delle Macie winery, a guest house, a pool and a restaurant," Mark Jaronski, director of media and communications for Darden Restaurants, told CNN. Olive Garden is a member of the Orlando-based Darden family of restaurants alongside Red Lobster, LongHorn Steakhouse, The Capital Grille, Bahama Breeze and Seasons 52. Olive Garden Head Chef Romana Neri runs the school in Italy. "Chef Neri is an executive chef who lives in Tuscany," Jaronski said, adding Neri supports the chain's Executive Chef Paolo Lafata when he's at the Tuscany property. Culinary pilgrimages to learn the cuisine of foreign countries are nothing new for many chefs and restaurateurs: Julia Child went to France, Rick Bayless to Mexico. The skepticism from viewers comes when a chain restaurant asserts authenticity. Specialties inspired by the Culinary Institute of Tuscany are marked on Olive Garden's menu with a special Culinary Institute of Tuscany seal: including the likes of Chianti Braised Short Ribs, Grilled Shrimp Caprese and Smoked Mozzarella Fonduta. Members of the public can also take part in a similar one-week learning experience under the Tuscan sun at the 11th-century, 450-acre property -- if they win the restaurant's sweepstakes. Judith Wilson of Spanish Fork, Utah, 40 minutes away from the closest Olive Garden, was one of the 2009 contest winners. After hearing about the contest, she made daily entries and won. "The cooking school took us in, and every day gave us lessons on all the different olive oils, cheeses, wines and how to complement your dinner with these choices," Wilson said. In the institute's off-season, the Riserva di Fizzano's restaurant, the Relais-Agriturism, serves up traditional Tuscan fare to the public. The Riserva also organizes cooking courses to educate visitors on Tuscan cuisine. Culinary institute skeptics or not, people are still embracing the "hospitaliano" -- Darden Restaurants reported in March that their fiscal third quarter U.S. same-restaurant sales increased 1.5 percent at Olive Garden.